If you know me personally, you probably knew that I worked on an app called Growing Pains for last year's BYU Mobile App Competition. 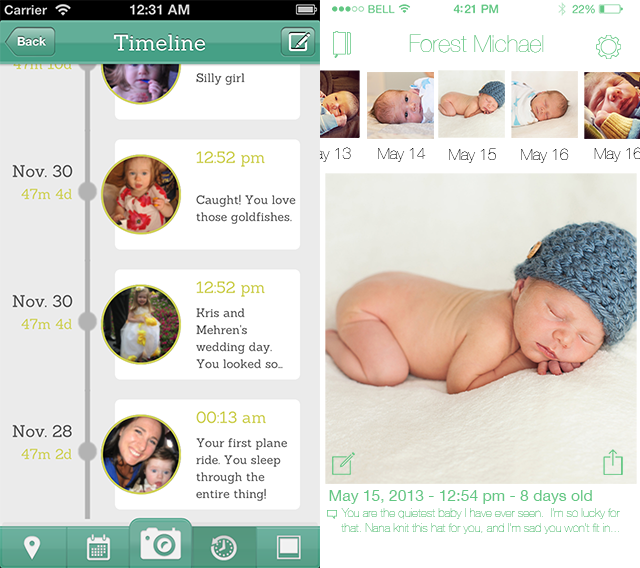 It's a photo journal designed to help you easily capture photos of your growing child. The interface is designed to allow you to quickly browse through and see your child's growth over various time periods (ideal for newborns and toddlers -- or puppies). While Growing Pains was a success in the competition, winning over $2000 value in awards and placing 5th overall, unfortunately it has not yet seen the light of day. A partner on the project and I have been talking recently about bringing it back to life, and last week while at Cocoa Camp Apple challenged us to bring our own ideas to work on, so I did just that. On Monday of last week I ctrl+shift+N'ed a new project in Xcode and started clean. Did this for several reasons, firstly, because Cocoa Touch changes so much from year to year that I'm sure our existing code base would require some amount of updating to get in line with the latest conventions and best practices. Secondly, and the bigger reason, is that while SDK changes have been semi-significant, changes to iOS design patterns have been EXTREMELY significant. Take the example below. You've probably seen and heard all about iOS 7, so I'll save my personal thoughts on the change for another discussion, the important points to note are the focus on simplicity, utility, and depth. With the greater population generally familiar with smartphones, as an app designer & developer I can now eliminate the use of some of the more cutesy effects that previously communicated "tap here", "I am a menu", "this is a button", and so on. Apple has also stressed depth in the new design, despite it looking more flat than before. By adding blurs, realistic motion effects, and new levels of perspective, iOS 7 is inherently more realistic than before, albeit far less skeuomorphic. Growing Pains is now undergoing its own transformation from the old world to the new. Here are a few of the design concepts for the new UI, shown alongside the original designs. Please feel free to jump in if you have any thoughts or suggestions. These designs are being iterated on almost daily at this point. What do you think? Are there any elements of the old design that you like better, or feel are missing in the new versions? Is it any more or less intuitive than before?